Mobility and flexibility are critical in today's fast-moving business environments. The Philips Pocket Memo dictation recorder gives you the freedom to work when and where you need to. The priority index tone indicates urgent documents. Your urgent jobs get transcribed first. The warning tones for end-of-tape and low battery status ensure that no dictation is cut off. The end-of-letter index tone indicates the start of each document and number of recordings. Easy and quick file editing via convenient slide-switch operation. It offers a fast response and is designed for single-handed operation. The turbo wind function allows you to jump to any part of the tape within seconds and save you valuable time. The status LED always shows if your battery is running low and the record status. 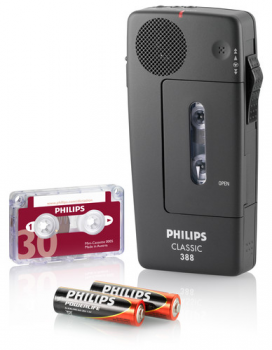 The warning tones for end-of-tape and low battery status ensure that no dictation is cut off. With the transport lock activated, your dictation recorder is protected from unintentional operation. Help protect the environment and save your money by simply recharging the batteries of your device instead of buying new batteries (optional Philips rechargeable batteries LFH0153 required). Product dimensions (W × D × H): 128 mm × 63 mm × 25 mm/5.0" × 2.5" × 1.0"